With age, a person’s forehead can drop resulting in eyebrows sitting at a lower level. It can also cause ‘droopy’ excess skin hanging over the upper eyelids which can create a tired, sometimes sad-looking, appearance. A brow lift (or forehead lift) is a surgical procedure that aims to rejuvenate the upper part of a face by lifting the forehead skin and the eyebrows. 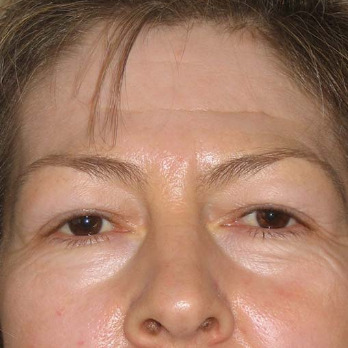 Brow lifts are most commonly performed using an endoscopic or keyhole technique and are usually carried out in combination with an upper eyelid reduction called a Blepharoplasty (see Blepharoplasty in the main menu). Some patients often require other facial surgery such as facelifts in order to rejuvenate the whole face. Mr Chana is one of the UK's leading practitioners of brow lift surgery and he is regularly asked to make comment or have his work featured in the national press and media. You can watch videos of Mr Chana's patients undergoing facial surgery here. An brow lift is carried out under general anaesthesia and usually requires an overnight stay in hospital. The proceedure employs a 'keyhole' approach involving five small incisions being made within the hairline to allow an endoscope to be inserted underneath the skin of the forehead. The hair is not shaved and the incisions are hidden within the hair-bearing scalp. The tissues are freed from their attachments and the eyebrows are lifted. Some frown line muscles are also removed through the endoscope and the forehead skin is then pulled to a higher level using a permanent stitch fixed to the bone. The incisions are closed using dissolvable stitches. No scars will be visible on the forehead. Following brow lift surgery, most patients will not experience strong pain. A slight headache may persist for the first few days which is easily relieved by mild painkillers prescribed by Mr Chana. Aspirin or aspirin-like medication (non-­steroidal, anti-inflammatory tablets) must not be taken. Following surgery you should avoid bending over or doing vigorous activity for a few days to reduce the swelling. It is also important to sleep in an elevated position using pillows behind the head to help reduce the swelling. Usually no visible bruising will occur on the forehead. However, as many brow lifts are usually performed in conjunction with a Blepharoplasty (eyelid surgery), there will be some bruising around the eyes for approximately two weeks. 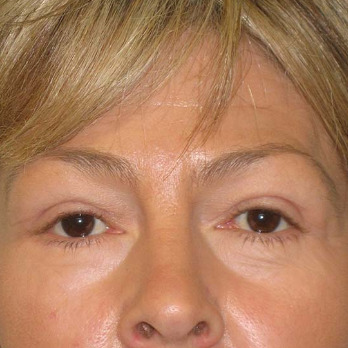 Complications are particularly uncommon following brow lift surgery. Infections are rare, but treatable with antibiotics. A haematoma (a swelling of clotted blood) and excessive bleeding are also rare. Some loss of sensation in the skin of the forehead and scalp may occur due to stretching of the nerves, but this usually recovers within a few months. Any risk of damage to the nerve which moves the forehead is exceedingly rare. Mr Chana will provide you with a comprehensive information leaflet on brow lift surgery following your initial consultation. If you are concerned about the droopy appearance of your eyebrows, which is often associated with excess skin on the upper eyelids, then a brow lift might be the solution. A brow lift will elevate the brow and provide a more youthful appearance to the upper face. It can also improve a tired, perhaps sad looking, facial appearance. Many people usually do not realise that a brow lift may be the ideal solution for them, since the main feature of concern is excess skin on the upper eyelid. It takes the experience of a skilled plastic surgeon to determine which component is due to excess skin on the eyelid itself and how much is due to skin dropping from a low eyebrow. Choosing an experienced Plastic Surgeon will provide you with the best opinion on whether an eyelid operation on its own will suffice or whether a brow lift performed in conjunction with an upper eyelid operation will provide the best result. Furthermore, Mr Chana is one of the few surgeons skilled enough to offer offer endoscopic (keyhole) brow lift surgery. Why is eyelid surgery often performed at the same time as a brow lift? There are two reasons for excess and heavy tissue on the upper eyelid. One is excess skin on the eylid itself and the second may be tissue which has dropped from the brow above. 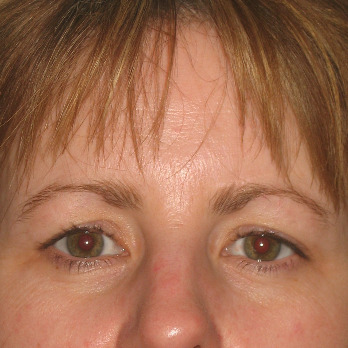 If this is the case an eyelid operation might not provide the best result and will need to be combined with a browlift. Of course, brow lift surgery can also be combined with facelift surgery to provide full facial rejuvenation. What results can I expect after brow lift surgery? The results will vary from person to person, but in generally a brow lift elevates the skin of the forehead and lifts the position of the eyebrows. The eyebrows should not be lifted too high since this gives a startled appearance. The aim of the surgery should be to create a natural appearance through subtle rejuvenation. Unfortunately, some of the horizontal lines and creases of the forehead will remain as this is due to the underlying action of the facial muscles. The frown muscles can be reduced by surgically trimming the muscle between the eyebrows. 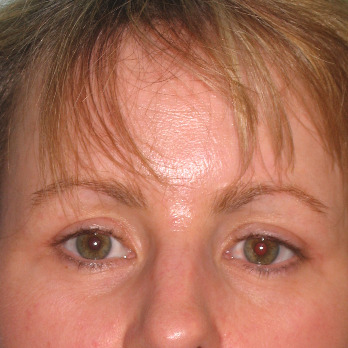 How is the long term result of a brow lift maintained? In the long term, the strength of the forehead muscle can have a tendency to pull the brow downwards again, however this can be counteracted with regular botox injections to maintain the effect of brow lift surgery. Is a brow lift painful? Since the surgery is carried out using an endoscopic (keyhole) technique there is minimal pain or discomfort . Mild pain can be easily controlled with painkillers.